Free Movie ticket, Padmaavat movie ticket offers, Padmaavat ticket book, Padmaavat Movies Ticket Offer – Hello Friends, Hope you are well & enjoying Tricks Store with Free recharge app & Free internet tricks. If you are also deadly waiting for Padmaavat movie and wanna spend your weekend in theater with your friends or family. Here is Bookmyshow back with another great offer on movie ticket booking. 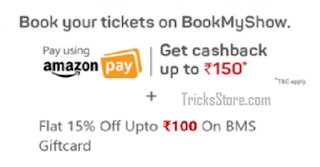 In this offer they are giving 50% cashback upto Rs.150 for All Users on Padmaavat movie ticket + extra 15% Off Upto Rs 100 on bookmyshow gift cards when you pay through Amazon.in. so guys totally you can get discount of Rs 250. That’s going to big loot guys, so hurry up and avail this offer now. Here you will get your first discount of total 15%. 3. Now Sign-up/Sign-in on BMS account. 4. Now select all your required details like City and the movie, your theater, Movie timings and the number of Seats you want to book ticket for Padmaavat. 6. After selecting your all details just Click on pay. 8. And Pay the remaining amount using Amazon Pay balance to get 50% cashback upto Rs 150. That’s guys, you saved your Total of Rs.250. You can avail both the above offers together or any one of the above offer. * Pay using Amazon Pay and get 50% cashback up to Rs 150. * Offer valid for all users (existing and new) amazon pay users on BookMyShow. * Use your Amazon.in account’s username and password to login on Amazon Pay. * Offer valid once/user till 4th February 2018. * You will get 15% discount on purchase of BookMyShow Digital Vouchers (E-Gift Cards) on Amazon India website and mobile apps. * Maximum discount of Rs. 100 per customer. * Offer is valid from 19th January to 26th January, 2018.